Yeringberg ewes outside the property’s cellar. AWARD-WINNING Victorian value-added lamb, beef and wine enterprise Yeringberg will be featured in a Meat & Livestock Australia Pasture Update next week. The update at the Yeringberg property at Coldstream west of Melbourne next Monday will give farmers a look into a successful fourth-generation farming business and advice on making sound economic decisions for their land. The update will be hosted by the Grassland Society of Southern Australia in conjunction with the Best Wool Best Lamb Yarra Valley Famers Group and will be at Yeringberg, 810 Maroondah Hwy, Coldstream on Monday November 12 from 10am – 2pm. Participants will also participate in a farm pasture walk and discussion and hear about Yeringberg lamb. The de Pury family has been producing lamb, beef, grapes and wine at Yeringberg for 155 years, using sustainable farming practices over four generations. 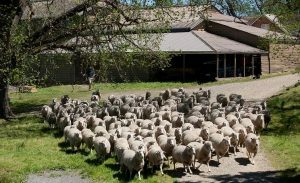 Yeringberg Lamb recently received a 2018 Delicious Produce Award – From the Paddock. The event will introduce a simple way to look at farm economics and business expenditure decisions and outline likely commodity prices over the next six months. GSSA president Matt Mahoney said the Pasture Update would be a great opportunity for farmers to get a better grasp on where their money is going, what their costs will be this season and making sensible decisions around expenditure. Sarah Clack from the Department of Economic Development, Jobs, Transport & Resources will give tips on how to value hay and silage and help with decisions around production, purchase and feeding. She will also bring a perspective from dairy farmers. Andrew Mann from Rabobank will provide a farm commodities outlook covering what farmers can expect to pay for livestock, fodder and grain and fertiliser over the next 6-12 months. Mr Mahoney said the Pasture Update would provide a down-to-earth and timely discussion about farm costs of production, forward planning, fodder crops and silage/hay. The Pasture Update costs $20 for Grassland Society and MLA members and $50 for non-members and includes lunch.